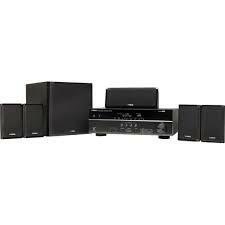 With satellite and center speakers and a subwoofer, this Yamaha YHT-4910UBL home theater system creates enveloping sound. To build a complete 3D home theater system, you’ll also need a 3D TV, 3D glasses designed for the TV and a high-speed HDMI cable. Include Dolby TrueHD, Dolby Digital Plus and DTS-HD Master Audio, so you can enjoy an immersive listening experience. Along with 4 satellite speakers, each with a 2-3/4″ full-range cone and a plastic cabinet, offers crisp, vibrant tones. With a 6-1/2″ cone and 100W power output delivers deep, full-bodied bass. The low-range enhancement technology ensures rich, powerful bass reproduction. Creates virtual 5-channel surround sound, so you can become enveloped in your favorite tunes. The CINEMA DSP technology supports playback of HD Audio for natural and expansive sound imaging. Along with a low-jitter PLL circuit provides high sound clarity. Analyzes your room’s specific acoustics and adjusts various audio parameters to ensure optimum sound in just a few minutes. Utilizes digital signal processing and algorithms to restore lost information due to digital sound compression. Along with 3D pass-through ensures stunningly realistic images are displayed on a compatible monitor. The Audio Return Channel function enables data to be sent and received via the same HDMI cable. Facilitates connection of a compatible Apple® iPod® or iPhone®, so you can easily play back stored audio files and charge your device at the same time. HDMI cable not included. High-speed HDMI cable is the only connection that can deliver a full high-definition experience with a full 1080p picture and digital surround sound. Reduces power consumption by approximately 20%. The selectable auto power-down function lets you turn the power off after 2, 4, 8 or 12 hours to help conserve energy.